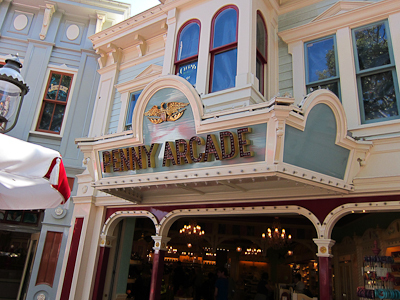 I have fond memories of the Penny Arcade, namely as the cheapest place that costs money in Disneyland. 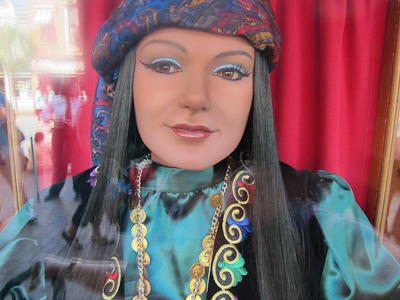 Like, a lot of Disneyland is free (and by free I mean included with your admission ticket) and there are some things you pay for (like frozen lemonade) or the penny squashing machines. 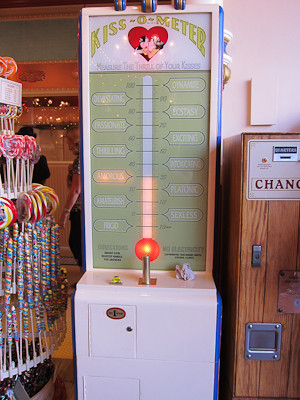 And the Penny Arcade, that actually cost a penny. I mean, one day they’re just going to stop making pennies, so let’s live it up! 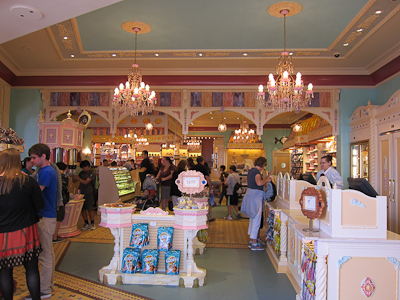 The Penny Arcade, Candy Palace, Gibson Girl Ice Cream Parlor, Blue Ribbon Bakery, and Carnation Cafe were all closed for quite a while for the major refurb, and many are now open. The opening of the Penny Arcade is now where the Restaurant That Can’t Decide What It Wants To Be Called is. I took this right after the musical chairs, actually. That stuff is candy, my friends. CANDY. I love candy. It’s probably a personal failing of mine. 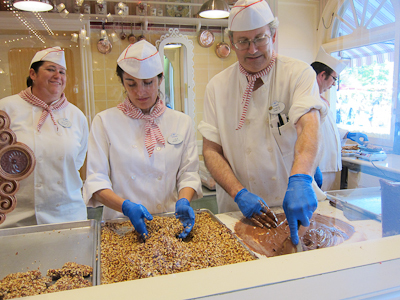 If loving candy is wrong, I don’t want to be right. 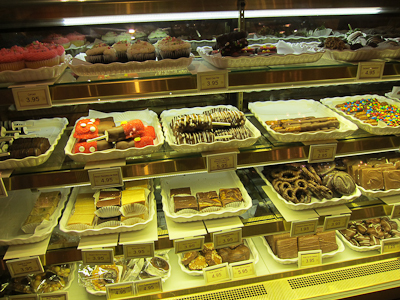 I particularly love the candies in the case. You can get all sorts of awesomeness. My favorite is the s’mores. It’s like a brick of graham crackers and marshmallows dipped in chocolate. What’s there not to love? There are two more. Can you guess what they are? I’ve mentioned them here. 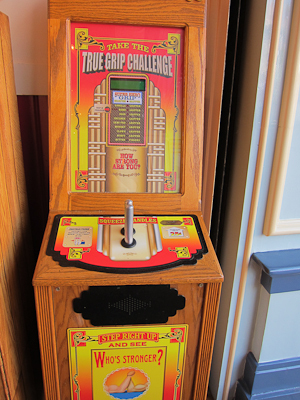 Anyway, aside from the candy and merch, there are the arcade games that made the Penny Arcade be Penny Arcadeable. Yes, that’s a word. Pronounced arcade-able. Yes, I can make up words just because I want to. It’s my blog. 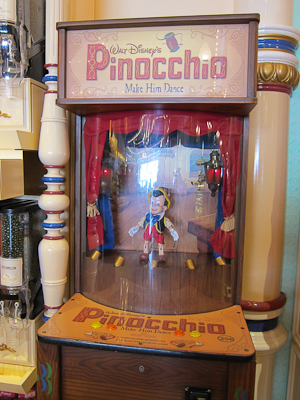 Put in a coin and watch Pinocchio do this thang. 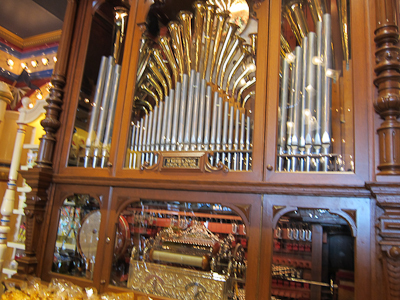 I also love the pipe organ thingie. Yeah, about that. I should probably mention that the Penny Arcade used to have its games lined up along the middle and walls of the store. 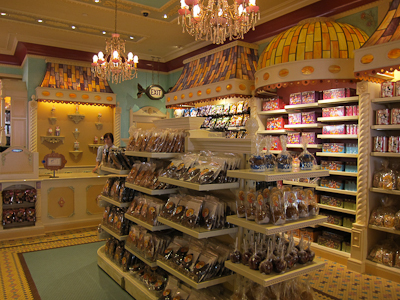 Now with the expansion of the Candy Palace, they’ve moved the games up to the front right by Main Street. These things, you put your money in and watch a movie. Much easier without glasses. I don’t even think we’re supposed to use the word frigid anymore. Besides, that sounds like a brand of freezer. 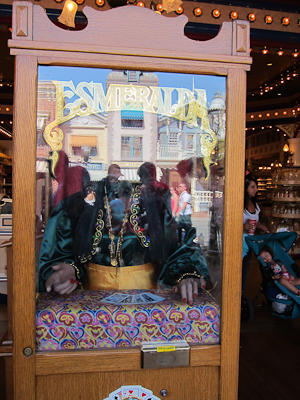 You can get your fortune read (but not Fortune Red) here, with Esmeralda. And there are a couple of other fun arcade games as well. Now for those of us who grew up in the 70s/80s and think that “arcade” is synonymous with pinball and Ms. Pac Man, it’s not an arcade, but it is an arcade in keeping with the time period of Main Street, U.S.A. And anyway, it’s fun. 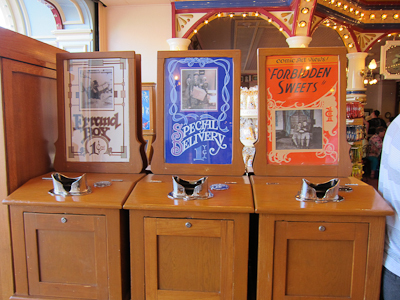 So bring some spare change and check out the Penny Arcade. Did you say once that you would like to be a princess?